Welcome to the first Glossies Made Me Do It of 2018. This link-up happens the first Friday of every month, and Ashley of Happy.Pretty.Sweet and I would love it if you joined us sometime! The idea? Share what a glossy (magazine) has made you do recently – try a new recipe/product, listen to a song, read a book, start a discussion/think of something new! We aren’t picky! Why yes, I do subscribe to Parents magazine and the January 2018 issue just helped inspire me even more about starting a bullet journal. Don’t know what a bullet journal is? Check out this website for more, but basically it’s a planner that lets you customize it however you want. Most people use a notebook or paper that has a dotted pattern making it much easier to write and doodle across the page. You can google image or Pinterest all sorts of examples. I saw so many cool bullet journals last year and I knew I wanted to try it, but I kind of love my other paper planners. What’s a planner lover to do? Use more than one planner of course! I decided to use my bullet journal as an entertainment journal of sorts for all 2018. It’s going to keep track of the books I want to read/actually read, movies I want to watch/actually watch, and so on and so forth. I think it will be a really fun look back at the year – in terms of fun and entertainment! 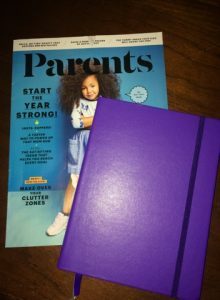 This issue of Parents has a two-page spread called Why You Want a Bullet Journal. Sure, it’s geared toward people with kids, but anyone can find inspiration. There are little symbols that people use as shorthand – like a circle means one thing, a “<” means something else. Parents gives a run down of what these all mean and I think I might utilize some in my own bullet journal this year. I actually got my bullet journal from Michael’s for $5! Yes, that’s right! Only $5!! I love that it has two ribbons so I can put them in different spots, helping me mark certain areas – like books I need to read each month and another page. I could also easily use a bookmark. I think I’d use one of those magnetic bookmarks as they seem to hold better with journals; I’d be afraid of a regular bookmark falling out over and over. The journal is a good size so you could easily carry it around. I’d probably keep mine at home most of the time, since it’s not a day-to-day planner, but if you want to make yours one, it’s great to tote around! One thing that I love about the bullet journal is how creative you can be. I’m not a great drawer, but it’s still fun to see how people decorate theirs and I want to do my best at making little doodles here and there. I might even include some good quotes from books read or movies/shows watched. It’ll be a memory book of sorts in that way. I do know that I’m going to use some fun stencils to help make sure the journal looks nice since I’m not the best drawer, or even writer (my handwriting is okay). I ordered a couple of stencils but they haven’t come in yet, so nothing to share yet. Once I get started on my bullet journal I’ll be sure to do another post and share what some of the pages look like! So tell me – have you ever used a bullet journal? Would you? 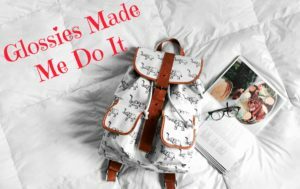 The link-up below will be open until January 19, so feel free to join Glossies Made Me Do It this month when you have time! We’d love to have you! If not this month, come back on Friday, February 2nd for the next Glossies link-up of the year! I love my bullet journal. I basically change how I use it as my needs change and I’m not stuck with the prefab. It has made me more artistic in that I learned to hand letter some and do little doodles! Good luck, I hope it’s fun and not a chore. One of these years I do want to try a bullet journal! I know another friend who did one last year and really enjoyed it. Nice find at Michaels! They have everything it seems! I want to try a bullet journal! I’ve been told by my sister many times to keep a journal, and I think this year is the year I should start! Thanks for sharing! Love the idea of an entertainment journal—how fun! I’ve never used a bullet journal but I’d love to try! I’m getting familiar with my new planner of the year–I have a Day Designer–which I’m loving so far, but I feel like it has a lot of extra space, that I’m not sure honestly I need. Or I just need to think of better ways to fill the pages. I’m not usually up at 5am so a lot of those lines are just fillers, ya know? Anyway, it’s always fun to see the differences in each planner to find what fits best! I love pictures I see of bullet journaling but I don’t think I’d be good at it! I never manage to stick with any kind of planner, bullet journal or otherwise, and finally realized that I’m just not a planner person. Or at least have never managed to find a single planner that does work for me. But for some reason, I really enjoy seeing posts about planner and bullet journals. I like both the organizational aspect and the creative aspect. Can’t wait to see what you do with yours! Love the idea, but I can never get into organizing like that. I am so spur of the moment except when it comes to work. Of course, I have to put meetings and stuff on my calendar, but planning for other things is hard for me. I will have to read more on bullet journaling. I’ve seen people do really creative and artistic spreads in their bullet journals 🙂 It’s great how much you can customize the bullet journal. That’s awesome you’re trying it out! I need to get a planner for the new year!! I already feel behind! Haha! I haven’t read a magazine in like, forever! I need to do that. Hmm, which one to pick up next time I’m out…? I LOVE Michaels for that reason! I want to look for a bulletin journal, it would be a lot of fun. I’ve read so many things about Bullet journals, but I’ve never tried to keep one. I haven’t gotten a planner yet, so maybe it’s my year to try. I’m going to have to hit up Michaels and see if I can find a deal like you got! I love bullet journals! The symbols are so helpful and keep things organized. I like the idea of a bullet journal and I know that they are really popular right now. I just don’t know that I would use it long term. For $5, it is worth finding out. I hope you enjoy it! I want to try bullet journaling in a cheap composition notebook that I already have to see if I will stick with it before buying any of the cool tools. I’m also determined to use my planner daily this year so maybe I should do something similar and have a bullet journal for entertainment or some other hobbies. I don’t read a ton of magazines that aren’t about cooking or knitting. I’ve seen bullet journals around and they look cool but I don’t think I’d be able to keep up with them. I like the idea of using one for entertainment though. I always forget what movies I’ve seen during the year. I hope you enjoy your new journal! This is so similar to what I’m doing this year! I’m making my bullet journal a reading journal to include things I’ve read, quotations, etc, as well as books I want to read to my kids and books we’ve read too. So fun! I’ve heard so many great things about bullet journals! This year I didn’t buy a 2018 diary but I’m using a journal I bought ages ago. On the one page it has a gratitude page and the other is just blank. I haven’t done a journal in years, but I have been doing a pregnancy journal each week. It is neat to look back on it already! 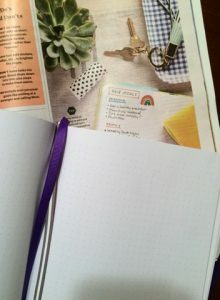 I used to be such a great journal er, and then I had kids… 16 years later I am still using the same excuse, so maybe I ought to try bullet journaling?! *sigh* yes, I love my bujo. It’s my happy place. lol Yay on the great deal at Michaels! herding cats recently posted: Don't Take It Personally...I Can't Review Your Book. 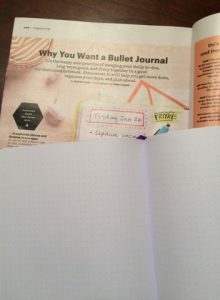 I love the *idea* of bullet journals, but I also know full well that it would be another thing for me to get salty at because I couldn’t keep up with it. I also don’t think I am very artistic or creative, so I feel like it would probably just make me frustrated rather than be fun- but I DO love looking at the cool things other people do with them! Shannon @ It Starts at Midnight recently posted: Are Sequels a Struggle? As you know I love my planner, but haven’t ventured into the world by bullet journalling YET! I kind of want to though. Getting stencils is a good idea, I have a fear of being too messy in a bullet journal and I know they’d help me a lot. Have fun! I always love to see other people’s bullet journals, but I tried to do one myself last year and didn’t have much success with it. I got so caught up in setting it up and decorating it and never really put much actual content in it. Heh, funny that it was a parenting magazine that convinced you to bite the bullet 🙂 I would be interested in seeing what you do with yours (I’m not much for drawing either). But the beauty of the thing is you can really do whatever you want with it! “bite the bullet.” Pun intended? 😉 I do like that you can create it however you like! Wow, $5 is not bad at all! I have a few friends who are really into bullet journaling. I have three planners for 2018 but no bullet journal! I do like my three planners. 😀 Happy New Year! I love the IDEA of a bullet journal, but I know myself well enough to know I wouldn’t stick to it. Plus, I’m just not artistic enough and I’d frustrate myself. But I love looking at pictures of other people’s! I would’ve been all over bullet journaling several years ago, but now… I just can’t get into it. I wish I could! Hi Daniela! Thanks for the comment. Definitely come link up with us some month. We’d be happy to have you. I’ll be checking out your bullet journal posts. I love seeing what people do. Thanks for sharing at Creative Mondays. Hope you can join us tomorrow.